Volvo entered a new era in its history on March 31,1999, when AB Volvo concluded its US Dollar 6.45 billion sale of Volvo Cars to Ford Motor Company. AB Volvo shareholders had approved the deal on March 8 and final regulatory approvals were received on March 29. The first instalment of payment from Ford has also now been received (the balance is due to be paid two years after the purchase date) and Volvo Cars is now officially part of Ford's Premier Automotive Group, alongside the likes of Aston Martin, Jaguar and Lincoln. "The Premier Automotive Group, under the umbrella of Ford Motor Company, will allow us to leverage the unique strengths of these four legendary brands, while preserving their individual values and characteristics," said Ford president and chief executive, Jacques A Nasser. "Our objective is to grow these premium brands, while setting new standards for the care and service of our customers." VCUK managing director, Gerry Keaney, says the sale to Ford is good news for Volvo dealers, their staff and customers. "We have already started to roll out the new generation of Volvos. S80 was the start and the next two years sees the most exciting period for new model introduction in the company's history. "With Ford's commitment to grow Volvo's volume, whilst maintaining its premium position, we can expect further expansion in the years to come as we access Ford's technology and develop more new models. The work being done to improve the customer experience must continue if we are to take advantage of all these new opportunities." Dr Wolfgang Reitzle, until recently a member of BMW's executive management responsible for product development, design, marketing and sales, has been appointed group vice-president of Ford's Premier Automotive Group. The role will involve him becoming chairman of Volvo Cars and of Jaguar Cars Ltd.
Dr Reitzle visited Volvo Cars' headquarters just a few days after his appointment. 'Volvo is one of the world's strongest brands and for me stands for robustness and safety," he said. I look forward to learning more about Volvo Cars and to fight for a stronger company." Jacques Nasser has set the Premier Automotive Group a target of 400,000 cars for the next year and one million cars some years into the 2 1 st century "Achieving this takes a lot of effort to strengthen and develop the company," Dr Reitzle says. SE Pack (not T4/1.8 £2,570. A new variant has been introduced to help develop diesel sales - the Volvo S40/V40 1.9 D S. This will feature 15" Deimos alloy wheels, sunroof, double headlamps, heated front seats, headlamp wash/wipe, roof rails (V40 only) and Madison velour upholstery and has been designed to target the fleet segment of the market. It will be a permanent addition to the range and will cost £18,405 OTR for the S40 and £19, 15 5 OTR for the V40. Having proved extremely successful in generating orders, the XS variant will be maintained until further notice. Due to the enhancement of the standard specification, however, the current specification will be changed at model year. It will now feature 15 " Spectra alloy wheels, an SC805 RDS single-slot CD radio cassette, front fog lights and headlamp wash/wipe. Three new engines will be introduced to the S40 and V40 -the RN 1.6, RN 1.8 and RN 2.0. Developed from existing products, these offer greater power and economy. As regards variants, the current XL, XT and XLT models are replaced by a new XT version. This will continue to be marketed at £500 above the standard specification and will comprise leather steering wheel, leather-faced upholstery SC805 single-slot CD radio cassette, integrated child seat and Star Sky inlays. The 2.0 1 10v 2.5 1 10v and 2.5 20v engines are all deleted. As the Torslanda specification is based on the 2.0 10v and 2.5 10v variants, this model is now not available. Two new engines - a 2.4 (140bhp) and a 2.4 (170bhp) - have been introduced on both the S 70 and V70 ranges. A standard AWD is being launched (£26,995 OTR for the V70) to help secure Volvo's position in the allroader segment, featuring the standard S70/V70 specification plus 16" Helium alloy wheels, front fog lights, heated front seats, load compensating suspension, luxury floor mats, dynamic chassis, headlamp wash/wipe, TRACS, rear mudflaps, roof rails (V70 only) and stainless steel sill covers. And a standard V70 XC has also been introduced (£27,495 OTR), also featuring 15" Terra alloy wheels, cross bars, a nylon safety net, grey sill covers, roof rails, folding rear bumper dust cover and heated front seats, load compensating suspension, headlamp wash/wipe, TRACS, rear mudflaps front fog lights, and cocos floor mats. As this is the S80’s first new model year, only marginal changes have been introduced. There are separate new Sports Design packs for the T6 model and all other variants, plus the addition of electric folding rear head rests to the Premium Pack. And there is a Communications pack featuring HU-801 RDS 4 CD radio cassette with Dolby Pro Logic Surround Sound and steering wheel remote control, RTI with TV and integrated GSM 'phone. Dynamic Stability and Traction Control (DSTC) is now available with the T6 SE. And a standard T6 specification will be introduced (£33,585 OTR), featuring a standard S80 plus 16 Regulus alloy wheels with locking wheel nuts, speed sensitive power steering and geartronic transmission. Planned introductions for December 1999 include a Bi-fuel variant for the 5cylinder 2.4, an LPG variant for the 5-cylinder 2.4, wing mirror memory for cars with power driver's seat, run flat tyres with low pressure warning system and telernatics available as an option. VOLVO Special Vehicles is looking to repeat its success with the Volvo T5 in meeting the fleet requirements of virtually every police force in the country by extending the range of police specification cars for ambulance and paramedic use. The range includes the Volvo S70 and V70 in 2.3 T5 and 2.5 D versions, while the Volvo V70 AWD and Volvo S/V40 2.0/2.0T have also been introduced. In a groundbreaking move for the UK ambulance industry, Volvo is also introducing the V90 ambulance. This will be the first UK ambulance not based on a commercial chassis and the first that has been crash-tested to the most rigorous UK safety and quality standards. It will also be the first with a full three year/60,000 miles vehicle warranty and the first to offer mechanical and technical support through a national dealership network. To manage the supply of Volvo ambulances and paramedic vehicles, Volvo has appointed the company UK Rescue Ltd as its sole agent. Based in Worcester and established specifically for this task, the company is owned and operated by John Hall. John was previously fleet manager for the West Midlands Ambulance Service and is well known in the industry through his association with both the ATAG (Ambulance Transport Advisory Group) and CEN (Committee for European Normalisation). "He brings a wealth of technical and operational knowledge and experience from within the ambulance industry," says Peter Cody, special vehicles manager in the VCUK Corporate Sales department. 'We believe that his skills and experience will prove beneficial in introducing these vehicles." The Volvo V90 is based on the limousine chassis and is a three-litre, six-cylinder, 204bhp, four-speed automatic vehicle that comes complete with ABS, power steering and air-conditioning as standard. It features a factory-built body and is partially prepared on the assembly line in Sweden. It is then adapted in the UK by Papworth Vehicle Body Builders of Cambridge, before final checking by a Volvo technician. John Hall explains: "The Volvo V90 ambulance, which comes with a Swede Rescue-fitted Allfa stretcher, is currently being evaluated over a three-month period by the East Midlands and Wiltshire services. "The East Midlands vehicle recently saw service at the Scottish Grand National, while the Wiltshire ambulance has been attracting a great deal of local media attention. "With the vehicle being based at Warminster, in a semi-rural location, the performance of the V90 means that compared with their other front line vehicles they have managed to reduce their 999 response times by a staggering six minutes." A third Volvo V90 ambulance will be coming over to the UK at the end of June, when it will go on display at the Ambex International Ambulance Exhibition in Harrogate. Among the other ambulance services already showing great interest are those in Scotland and the West Country where journeys can often be 100 miles or more. 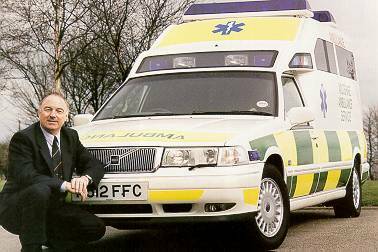 John concludes: "Around 950 ambulances are bought in the UK each year, so the potential for Volvo to emulate the success it enjoyed with its police vehicles is most definitely there."